Nolan Stevens' father, John, helped coach the Los Angeles Kings to the 2012 Stanley Cup. Photo by Tom Sorensen. Nolan Stevens doesn’t believe in superstitions. After the Los Angeles Kings claimed the 2012 Stanley Cup, the Manhattan Beach, Calif. native didn’t hesitate to touch the sacred trophy. “I went to all the home games and the playoffs,” said Nolan, a Los Angeles Junior Kings alum whose father, John, is an assistant coach with the NHL team. “We were on the ice after and in the locker room, and something like that really opens your eyes. It gets you thinking that could be you one day. You see how hard the guys worked and how happy they were that it has finally happened. It’s special for me and was a privilege to be watching that. Stevens waited a while to don the red, white and blue. But it was worth the wait. Photo by Dave Reginek. 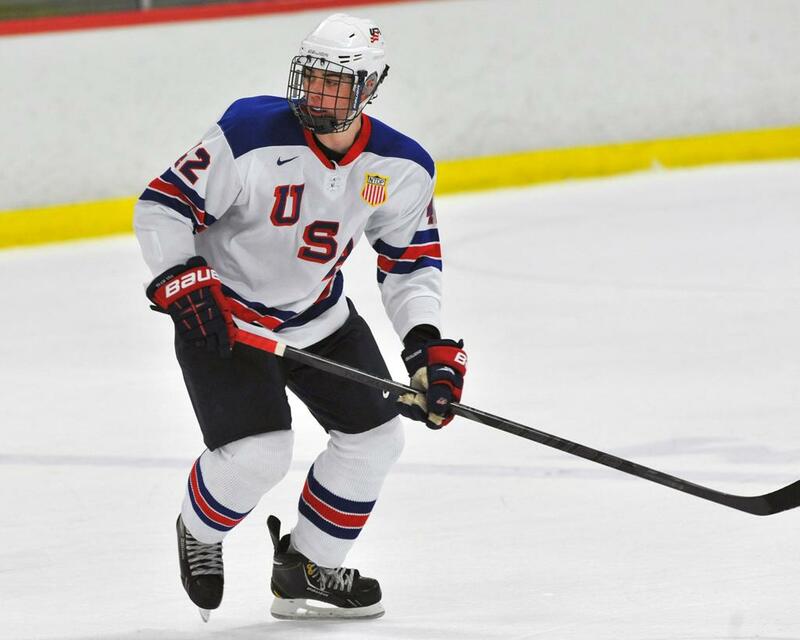 Nolan, a 6-foot-2, 186-pound forward who just wrapped up his first season with the USA Hockey's National Team Development Program, grew up in a hockey family. His father played 14 seasons in the AHL and NHL and has coached in both leagues. Meanwhile, his older brother, also named John, recently finished his first season with the United States Hockey League’s Dubuque Fighting Saints. Even though John Sr. grew up in Canada, he was supportive of Nolan’s decision to come to the NTDP and continue his hockey career. However, there is still a “little rivalry” in the house. Then again, brother John might have some bragging rights this summer after Dubuque won the USHL’s 2013 Anderson Cup (regular season) and Clark Cup (playoffs). The two brothers played against each other a few times later in the season. “We get along great,” said Nolan, who admits he has always looked up to his older sibling. “We usually train together in the summer. I didn’t say anything during the games, but we would go to dinner after the game. 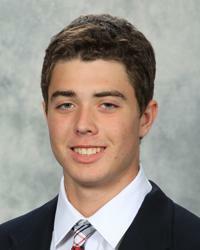 Despite missing part of the season due to injury, Nolan Stevens finished with three goals and eight points in 25 contests. For him, the most special part was finally being able to don the USA sweater. It also helped Nolan that this dad offered some words of advice that he took to heart while he was waiting to get on the ice this season. This helped make the end of the season so special for Stevens as he worked to get his game speed up to snuff. One of his most memorable moments came in the final game of the season, a 3-2 shootout win at Cedar Rapids on April 13.